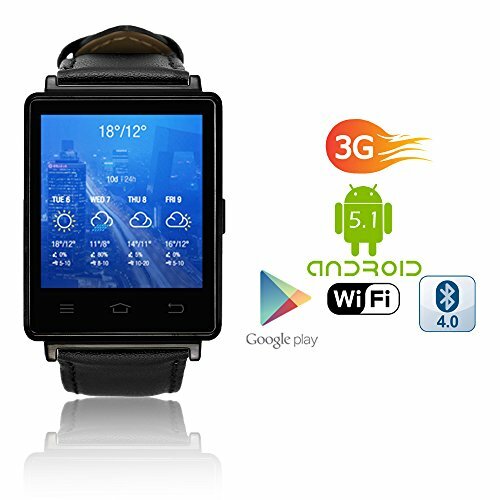 Introducing the most powerful Indigi D6 Android 5.1 OS 3G Smart Watch Cell Phone - featuring a 1.63in HD Touch Screen that even has a built-in heart rate monitor sensor. The Quad-Core CPU @ 1.3GHz results in an excellent functioning smart watch. The indigi D6 Smart Watch & Phone is our latest Smart Watch/Phone's to date. Stay connected via Bluetooth 4.0 and track your activity through the heart rate monitor, pedometer, and calorie counter. With an HD responsive touchscreen, integrated microphone and speaker, the D6 acts as a wireless dialer, allowing users to handle calls directly from their wrist - bringing you all functions of a modern smartphone in a convenient wrist watch form and at a fraction of the price! Complete with Bluetooth 4.0, GSM Quad Band connectivity and being fully unlocked. The S6 is a quadband GSM (850MHz, 900MHz, 1800MHz, 1900MHz) unlocked phone that can be used from anywhere across the world. You can stick in your GSM micro SIM-card and you can gain instant access to an amazing communication device that works like a cell phone on your wrist. Don't want to use it with a SIM Card? No problem! The D6 is interconvertible between Bluetooth mode and SIM card mode, allowing you to slot in a micro-SIM card on board or connect to your phone via Bluetooth. Indigi D6 is also smart enough to work and function without a sim card and is compatible with all Bluetooth devices. The smartwatch is made to connect to your smartphone via Bluetooth 4.0 and bring all the features to your wrist. On incoming calls, the D6 rings and vibrates, displaying the caller number and/or contact on its HD screen. You can easily answer or reject calls thanks to the buttons and integrated speaker and microphone. The D6 Smart Watch also notifies you of missed calls, incoming SMS, and other notifications from your phone. IP65 Water Resistant | 3G Support| 2-in-1 interconvertible (SIM Card or Bluetooth Sync) | 1.63" HD Capacitive Touch Screen | WiFi | Bluetooth 4.0 | Google Play Store | GPS(Google Maps) | Music Player | Accurate Heart Rate Monitor | Pedometer | Internet Browser | Weather Forecast | Time Display (30+ Watch Faces) | Calls (Answer, End, Reject,Dial) | Caller ID | SMS Notification + Reply | Facebook | Twitter | Gmail | Calendar etc.